Or, you could join us for a celebratory drink to welcome the show on the 25th of February from 6pm and meet Des for yourself. Tres bien. We will be having a celebratory drink to welcome the show on the 30th of April from 6pm. Please join us and meet Julia. Beautiful photographs + Beautiful books. Too good to refuse. A selection of Matt's photographs will be in-store from the 26th of March. We will be having a celebratory drink to welcome the show on the 26th from 6pm. Please join us and meet Matt. We are honoured to welcome special guest, artist, MATT PALMER as Artist in Residence and guest curator of Curated Creative, our ongoing online project. A selection of Matt's 'Little Birds' portraits will be in-store from the 26th Feb.
We will be having a celebratory drink to welcome the show on the 26th Of Feb.
We are honoured to welcome special guest, artist, ceramicists, jeweller, SASSY PARK as Artist in Residence and guest curator of Curated Creative, our ongoing online project. A selection of Sassy's exquisite ephemeral jewellery will be in-store from the 16th December. We will be having a celebratory drink to welcome the show towards the end of January - date to be locked in soon. Please pop in beforehand and try on a necklace or ring that you will won't be able to part with. We are honoured to welcome special guest, photographer, TAMARA DEAN as Artist in Residence and guest curator of Curated Creative, our ongoing online project. A selection of Tamara's stunning photographs will be in-store from the 15th of October. Friday, October 24th between 6-8pm to meet the artist and have a celebratory drink to launch the show. Please email us at mail@publishedart.com.au or phone on 9212 1169 and let us know you'd like to come. We had a great day on Saturday with the Surry Hills Festival. Many thanks go to Gary Heery for coming to the store and speaking about his work and experiences in the photography world. We are thrilled to have his book GARY HEERY SELECTED WORKS in stock. Check it out. Level 1, 52 Reservoir Street, Surry Hills. Above Single Origin Roasters. We are proud to be hosting a gorgeous collection of Phillippa Carnemolla's stunning work from her exhibition titled, Naturally Connected: Bees & the Universe. We would like to invite you to celebrate having these beautiful pieces in our store and it's an opportunity to meet the artist herself. Pip has also given us a list of some of her favourite books of inspiration. Click on the link below to find out about these books and more about Pip. If you could email us to let us know you'll be able to come to our drinks, we'd greatly appreciate it for numbers. 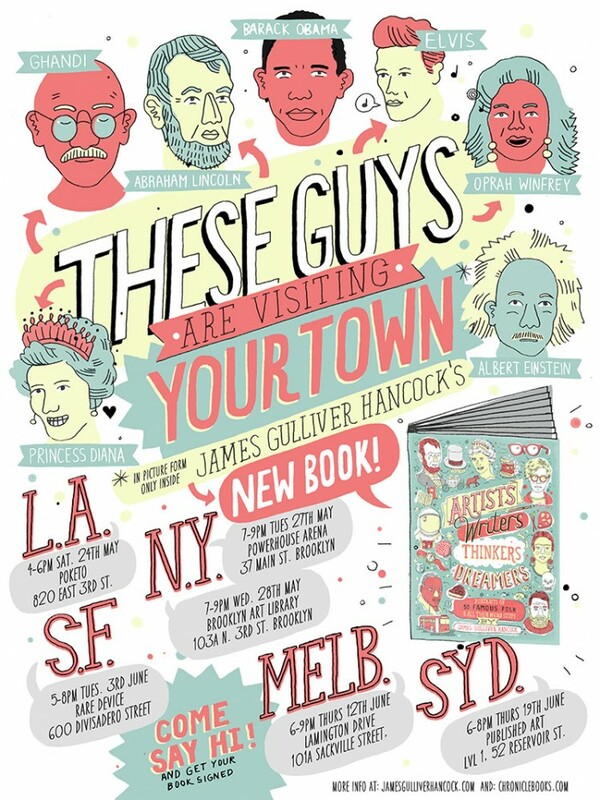 Today (Thursday 19th June) we are having a party to launch the new book by James Gulliver Hancock called ARTISTS, WRITERS, THINKERS, DREAMERS from 6-8pm. James will be here so grab him to sign your books. It's also an opportunity to re-launch PUBLISHED ART in it's new location - Level 1, 52 Reservoir Street, Surry Hills - and to meet it's new owners. We have the guys from TROLLEY'D mixing up some cocktails with FOUR PILLARS gin.